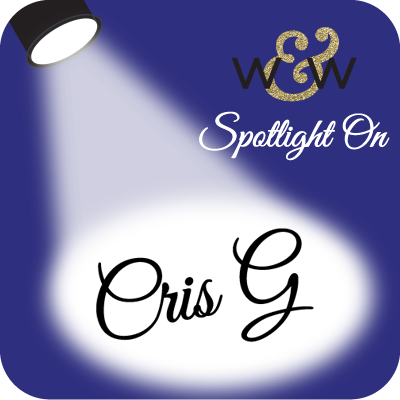 We are so happy to have Cris G back with us for another sensational post with panache and elegance! If you missed learning more about Cris and seeing her first post full of gorgeous black & white projects CLICK HERE! Here I am for my second post. 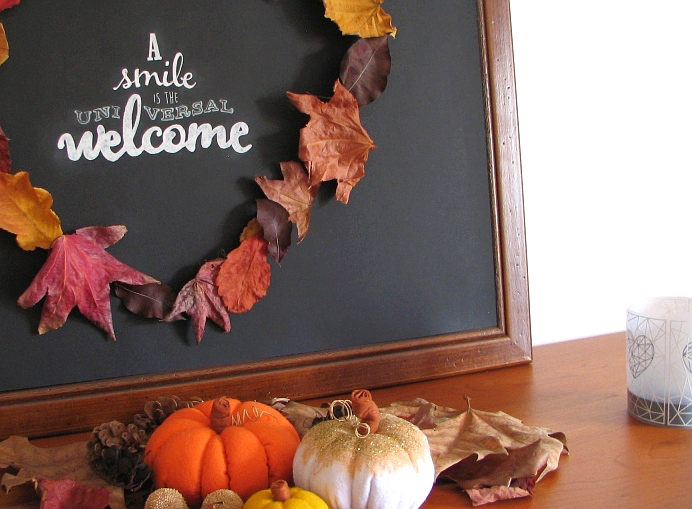 Today I’m bringing something a little bit different - a Fall themed home décor. I kept the main palette in black and white, with just the right amount of gold and copper :)... you know, just to add some sparkle to these pesky days. 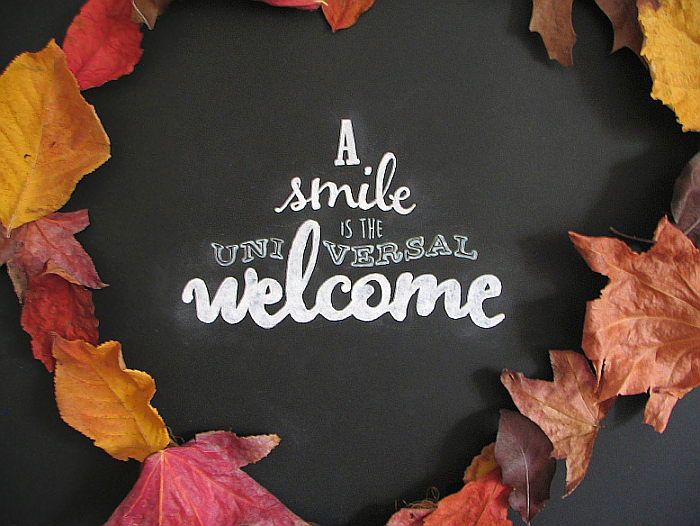 ... and a welcome are the best way to start, don’t you think? To make this framed greeting, I started by stamping the word “smile(s)” from Winnie & Walter The Big, the Bold and Friends stamp set and drawing the contour of the biggest word “welcome” from Winnie & Walter The Big, the Bold and Blessings Creative Screenings in a piece of scrap paper. The next step was scanning to my computer. After enlarging both words, I used three different free fonts to compose the greeting in a sheet of printer paper. Using a piece of yellow carbon paper, the one used for embroidery, trace the letters onto a sheet of black cardstock. Then draw/paint in white. I traced the smaller and the thinner lines using a Uniball white gel pen, and filled in the bigger words using a Uniball liquid chalk marker. I made an uneven heart shape around the words with some twigs, rope and leaves from last Fall :). Glue this kind of wreath to the cardstock with a glue gun, and then the leaves. The free fonts I used, from top to bottom, were: Marlboro, Moon Flower Bold, and VintageOne. Stamp the Winnie & Walter Mini Scenery: Multifaceted four times with VersaMark ink onto a sheet of vellum paper and heat emboss in white. Using the faceted heart shape from Winnie & Walter True stamp set, align with the previously stamped vellum doing almost the same procedure from step 1. The only difference is that you will be stamping on acetate and heat embossing in black. 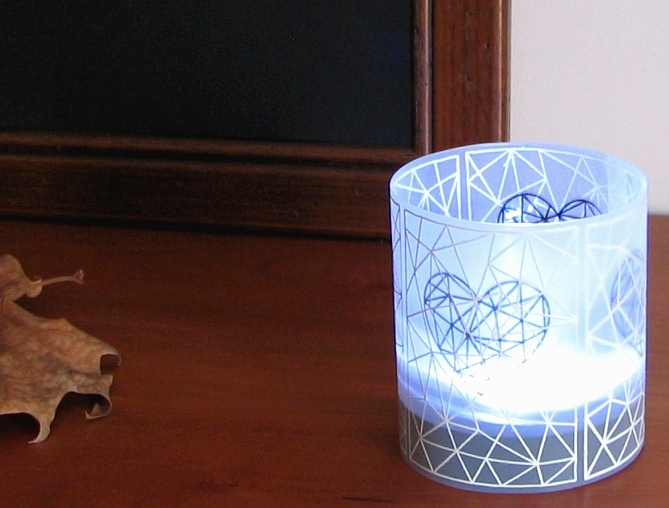 Glue a strip of black cardstock in the bottom of the acetate sheet, so the lamp won’t show much. I used a LED lamp, the ones used in closets, in two different colors... this is another reason to justify the black cardstock. TIP - Glue each layer separately, I used mini dots. This way you will have more combinations: use just the vellum, just the acetate, or both. 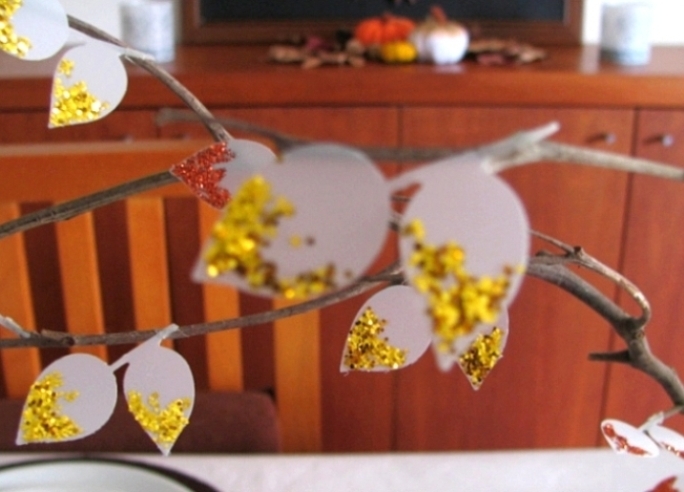 Use die cut leaves to decorate the table. Gather some twigs. Die cut vellum leaves from Winnie & Walter In Bloom: Maggie’s Roses Cutaways, partially coat them with Glossy Accents and glitter. Glue the leaves to twigs. This is the tricky bit... I tried with different types of glue, but vellum resisted to most of them, and it would have been unthinkable spend the evening gluing leaves with GA, for example, which I haven’t tried but might have worked. I haven’t used my glue gun as it would show much, so, I ended up using thin double sided tape, it was fast and worked just fine. 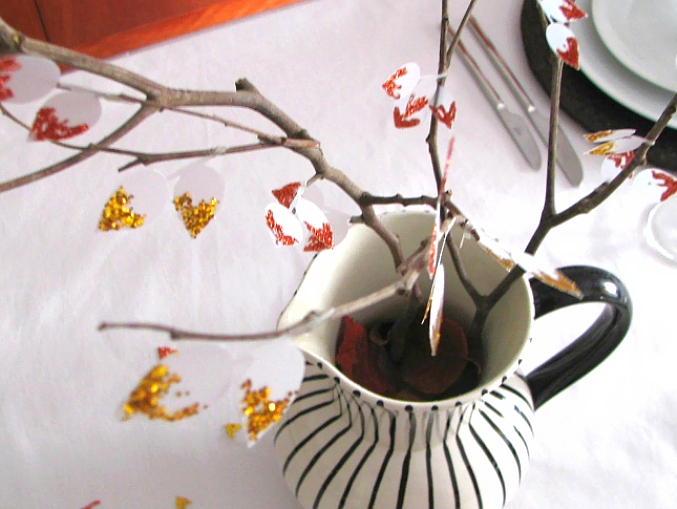 TIP - Scatter some of the vellum leaves on the table, it will add to the Fall look. Using different containers instead of a regular vase brings some interest, I used this jug that I remember seeing at my parents since forever, and I absolutely love... besides, it has stripes and is black and white! 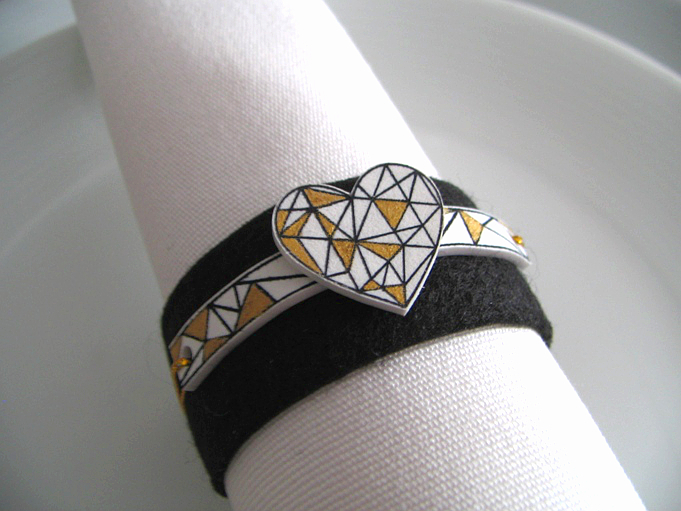 Napkin rings are a great addition to complete the whole décor for a special occasion. For these rings I started with a stripe of cardstock and another of black felt, first adhering both together, and then in a closed ring. To make the embellishments I used the Winnie & Walter True stamp set. Stamped the faceted stripe and the faceted heart in white shrink plastic and... voilà, the cutest ornaments for napkins! In fact there was one more step; grabbed my glasses and the tiniest brush I have and colored just a few triangles with gold craft paint. TIP - If you wish to experiment with shrink plastic, if you haven’t already done so, know that you can bend any piece. You’ll have to find some glass or other non heating material with a rounded shape, or other shape, and carefully (it is hot!) but fast, roll the piece of plastic around the glass and let it cool. If you want to paint some very small areas, like I did here, it is easier to do it before shrinking, but you will need permanent inks, and let dry thoroughly before shrinking. You will find very good tutorials and videos with great information about this on the net. Thank you so much for stopping by, and a big thank you from the heart to Julie and Shay for inviting me to the Spotlight! Cris I LOve all your projects... but your vellum leaves have me heading out to the woods!!! Wow! Love these projects too! SO cool to think out of the box! Wonderful ideas, Chris! I love when we can put our stamps to use for something other than cards! Amazing, love the fall decor items you created with Winnie & Walter stamps, WOW!!! Chris, I'm in breath-taken-away awe at the fabulous home decor projects you've created! Your wreath captured fall's splendour beautifully; the luminary is lovely, the twigs and leaves ever so pretty and the napkin rings a touch of class to any table setting. Wow...just wow! You are so creative...you always think outside of the box with huge amounts of WOW factor. LOVE your faceted luminaries and napkin rings, LOVE your welcome frame and sparkling leaves too!! !